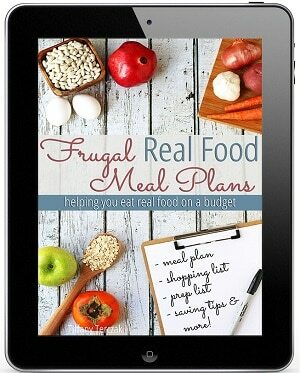 You are here: Don't Waste The Crumbs » Real Food 101 » Cooked Beans or Dry Beans, Which is Cheaper? Part of my strategy for eating real food on a budget (which is the EXACT same strategy I teach in Grocery Budget Bootcamp) is to make foods from scratch, when it counts. 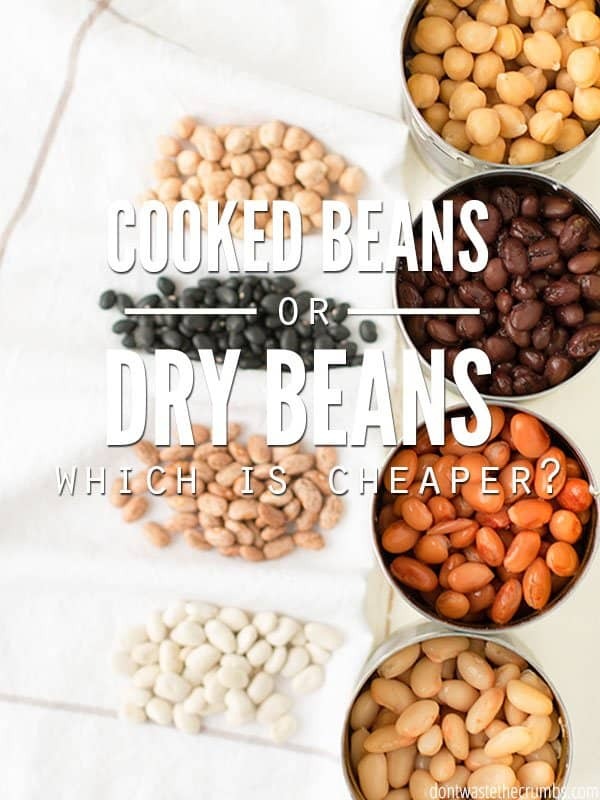 Have you ever wondered if cooking dry beans cost less than buying canned beans? 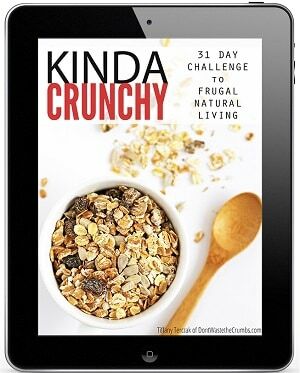 I’ve wondered that myself, and today I’m crunching number to see which is cheaper. Before we dig in, let’s set some basic ground rules. 1. What store do we use to compare prices? I want to use prices that are comparable across the country. That way, this exercise applies no matter where you live in the States. I’m choosing Walmart because it’s a national chain and the prices don’t vary too much from region to region. To account for any variation there might be, I’m using online prices, since they’re available to everyone. 2. What type of beans do we use? 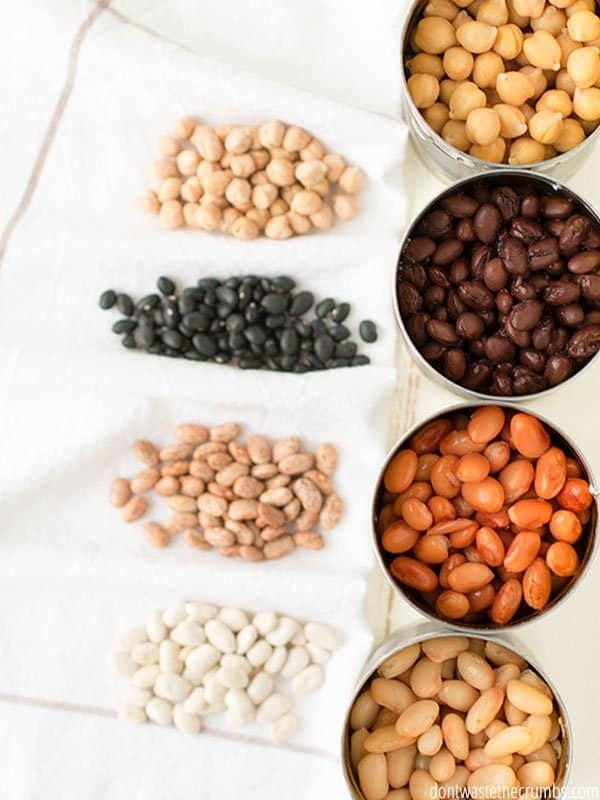 These four types of beans make up the majority of bean recipes. Plus in a broader sense, they’re affordable and my family likes them (especially in black bean brownies and cookie dough hummus). 3. What quality of beans do we use? The price of beans will depend largely on the brand and whether or not you choose organic (or non-GMO or BPA-free cans, etc.). Since I’m wanting to eliminate as many variables as possible that would skew the basic comparison of dry beans versus canned beans, I’m using generic-brand beans. Not organic and nothing fancy. Just plain beans. Every bean cooks up differently, depending on its size, but the typical yield seems to be that beans triple in volume and/or weight when cooked. On average, the typical pound of dry beans yields anywhere from 5 to 7 cups of cooked beans. When possible, I’ve noted a better dry to cook yield for each bean and the source. If I could not find a source, I went with the average of 6 cups. 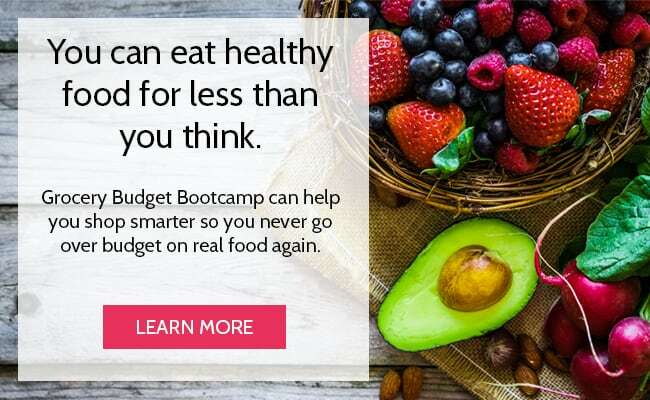 One serving of cooked beans – whether they are from a can or you make them from scratch – is ½ cup. One 15 oz can of beans is equivalent to 1.75 cups cooked beans and there are 3.5 servings in one can, regardless of the type of bean. Note that some cans contain exactly 15 oz, some contain 15.25 oz and some contain 15.5 oz. I don’t know for sure, but my best guess in the slight variation in the can size is due to the variation of the bean size. Okay, the ground rules are set. Let’s see which is cheaper, dry beans or canned beans! Which is cheaper: dry black beans or canned black beans? Walmart.com didn’t have a one pound bag of Great Value black beans, but they did have a two-pound bag for $2.78. One pound of dry black beans costs $1.39. According to Serious Eats, one pound of dry black beans will yield 7 cups of cooked black beans. One pound of dry black beans will yield 14 servings. One ½ cup serving of cooked-from-scratch black beans costs $0.10. Walmart.com offers a 4-pack of Great Value black beans for $2.50. One 15.25 oz can of cooked black beans costs $0.63. One ½ cup serving of canned black beans costs $0.18. 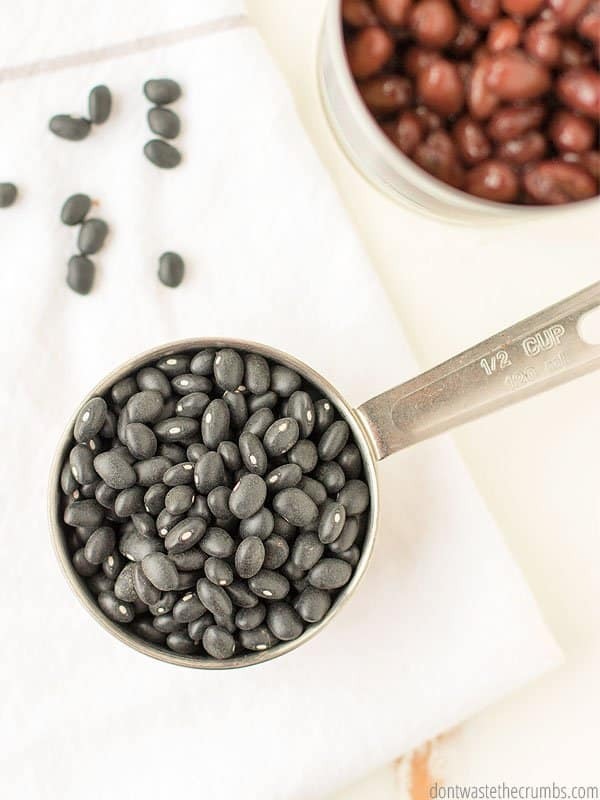 Dry black beans cost less than canned black beans by $0.08 per serving. If you find canned black beans for 35¢ per can, you break even in cost. 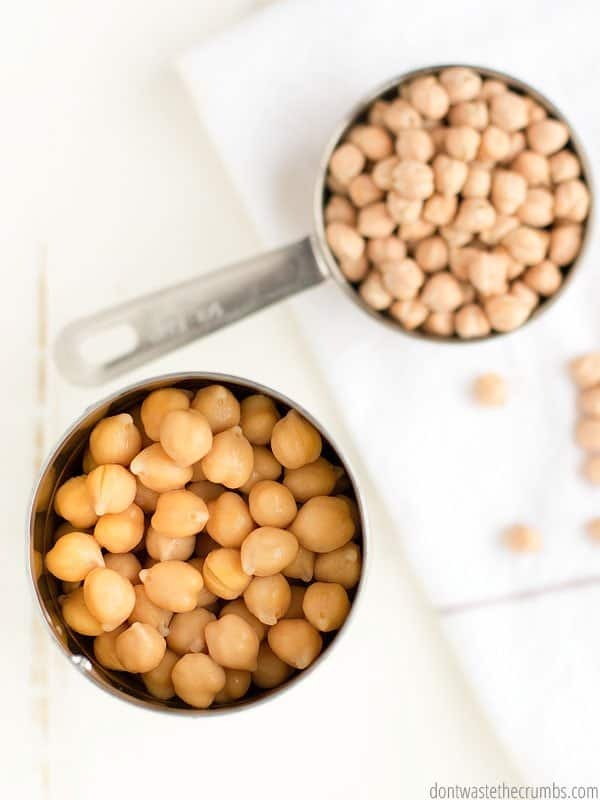 Which is cheaper: dry garbanzo beans or canned garbanzo beans? Walmart.com does not sell store-brand garbanzo beans online, so I’m using the cheapest option available, El Mexicano brand. A one-pound bag of this brand is $1.78. According to Serious Eats, one pound of dry garbanzo beans will yield 7 cups of cooked garbanzo beans. One pound of dry garbanzo beans will yield 14 servings. One ½ cup serving of cooked-from-scratch garbanzo beans costs $0.13. Walmart.com does not have canned store-brand garbanzo beans online that were NOT just plain beans. They had no-salt added and organic options, but not just ordinary nothing fancy beans. My default is to use the cheapest option available then, which in this case, happens to be S&W brand garbanzo beans. One 15.5 oz can of canned garbanzo beans costs $0.86. One ½ cup serving of canned garbanzo beans costs $0.25. Dry garbanzo beans cost less than canned garbanzo beans by $0.12 per serving. If you can find canned garbanzo beans for 46¢ per can, you break even in cost. 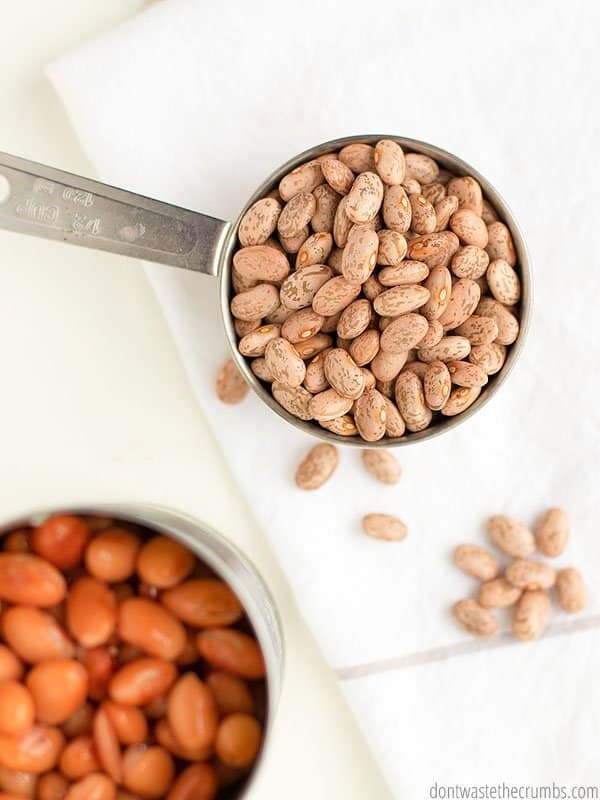 Which is cheaper: dry pinto beans or canned pinto beans? Walmart.com offers dry pinto beans in two different sizes, 32 oz (2 lbs) and 64 oz (4 lbs). We know that we can save my by buying in bulk, but let’s see how much and compare both of these sizes to canned pinto beans. 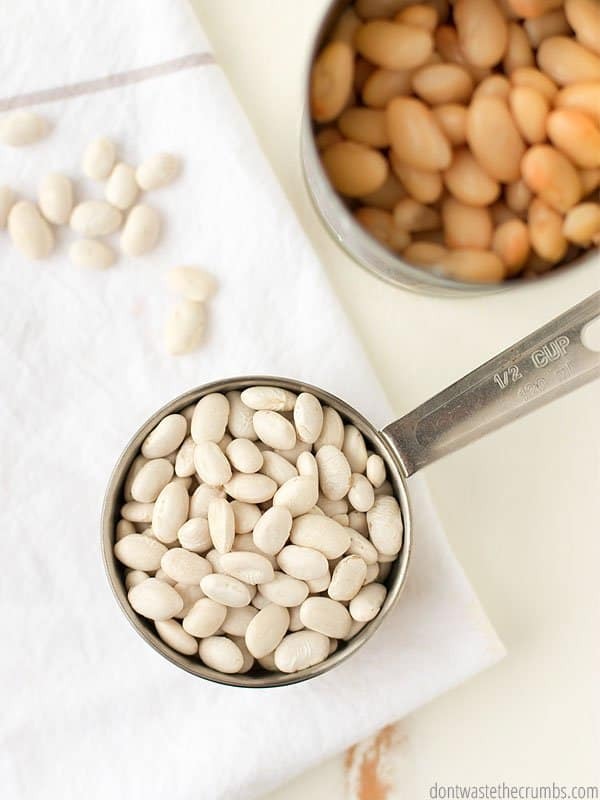 According to Serious Eats, one pound of dry pinto beans will yield 7 cups of cooked pinto beans. One pound of dry pinto beans will yield 14 servings. If you buy a 2 lb bag, one pound of dry pinto beans costs $1.04. If you buy a 2 lb bag, a ½ cup serving of cooked-from-scratch pinto beans costs $0.07 (rounded from 0.074). If you buy a 4 lb bag, one pound of dry pinto beans costs $0.92. If you buy a 4 lb bag, a ½ cup serving of cooked-from-scratch pinto beans costs $0.07 (rounded from 0.065). Walmart.com offers a 4-pack of Great Value pinto beans for $2.50. One 15.5 oz can of canned pinto beans costs $0.63. One ½ cup serving of canned pinto beans costs $0.18. Dry pinto beans cost less than canned pinto beans by $0.11 per serving. If you can find canned pinto beans for 25¢ per can, you break even in cost. Note: Walmart.com had dry pinto beans in larger sizes as well, including an 8 lb bag and a 20 lb bag. However, the price per ounce of the beans were 7¢ and 6.2¢ respectively. To put this in perspective, the 2 lb bag was 6.5¢ per ounce and the 4 lb bag was 5.8¢ per ounce. A perfect example of how buying in bulk CAN save, but that it’s always best to check prices. In this case, the 4 lb bag was the best deal. You would have paid more per ounce (and in turn, per pound) if you bought the 8 lb or 20 lb bags. Which is cheaper: dry great northern beans or canned great northern beans? Walmart.com didn’t have a one pound bag of Great Value great northern beans, but they did have a two-pound bag for $2.84. One pound of dry great northern beans costs $1.42. According to the USDA, one pound of dry great northern beans will yield 6 cups of cooked great northern beans. One pound of dry great northern beans will yield 12 servings. One ½ cup serving of cooked-from-scratch great northern beans costs $0.12. Walmart.com does not have canned store-brand great northern beans online. They did however, have store-brand in the store. Since I want to keep it a fair game from region to region, I’m only using online prices. My default then, is to use the cheapest option available online. In this case, it’s Bush’s Best reduced sodium great northern beans. One 15.5 oz can of canned great northern beans costs $0.98. One ½ cup serving of canned great northern beans costs $0.28. Dry great northern beans cost less than canned great northern beans by $0.16 per serving. If you can find canned great northern beans for 42¢ per can, you break even in cost. Across the board, it’s cheaper to by dry beans and cook them yourself than it is to buy canned beans. The one thing I didn’t take into consideration in this cost comparison was the actual cost of cooking. The price of electricity and gas varies, as does the cooking method (i.e. whether you cook on the stove, in a slow cooker or in an instant pot), which makes it difficult to draw a clear cut answer. If you’re interested in including these numbers as well, this article is a good place to start with a simple, breakdown of the cost to use a slow cooker. Many people complain that beans give them gas, and therefore don’t eat them. If that’s you, I encourage you to de-gas your beans by soaking them using this method. As the temperatures warm up this summer, cook your beans in a slow cooker to keep the house cool. One last thing to consider is the additives and preservatives added to canned beans. In the four beans mentioned above, I found calcium chloride and disodium edta. Compare against the only ingredient needed to cook beans at home: water. Do you buy canned beans or dry beans? 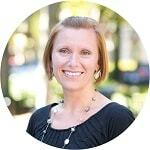 Have you ever broken down the price before to see if what you buy is the most affordable? I haven’t bought canned beans in a very long time. I have some dried beans hanging around, but I can most of them myself. I sterilize one side of my sink and put in the beans and then I cover with water and leave overnight. The next day I fill my quarts a little more than half full and add water. I put the garbanzo in pint jars because well, we like hummus but not in that quantity eh?? ?…..lol Process for the recommended time and I have canned beans that are much safer to eat. No BPA and I always buy organic. I’m going to have to figure out how much I pay per can. Prices up here in Canada are a bit higher than yours. I use dry beans ONLY because of the chemicals in canned beans. The added ‘citric acid’ is often made from corn. If it says naturally derived citric acid, I check with the company to determine what type before I will use it. Hi Tiffany! I am catching up on your posts about making beans. You mentioned in one post that you commonly cook enough beans for the month and then store them. How do you store your beans for the month? Thank you! 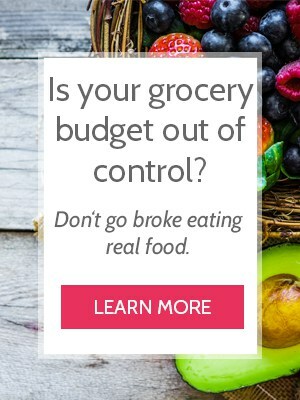 I mostly buy dry beans, but always have a few cans of cooked beans around for emergencies, and I try to get organic ones from Aldi or Traders Joe’s because they’re pretty cheap. We eat so many beans, I would find dealing with all the cans annoying (storing them, recycling them, etc.). But of course, my biggest reasons are for cost and avoiding the additives (although, the organic ones don’t have them). By the way, does anyone know of a good source for dry organic beans for cheap? Christie – Palouse Brand (http://amzn.to/2otvjXl) is certified non-GMO and they do all their processing in-house (they grow, package and ship themselves). I don’t know about cheap, but they’re definitely quality! Sam’s Club has 10-pound bags of organic black beans for $12-13. Kroger has smaller bags of Simple Truth Organic beans and lentils decently priced if you catch them on sale. Hello! 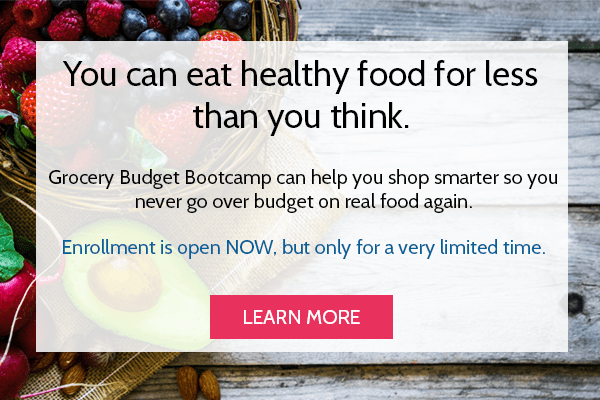 Just discovered your website and have started some almonds to try to sprout — thanks! In regard to the dry vs canned beans — Thank you for doing the comparison. I am wishing you had added the cost of soaking (water) and cooking (propane/wood stove/natural gas), as these considerations go into my decision of what beans to buy, living off-grid. What about the cost of water and power to cook the beans? The cost of water and power varies from area to area, and is even free for some people. However, if you were to actually calculate the cost of water and power, I think you’ll find that it’s negligible.